We’re a little cheesy with our last post for January. But, it seems appropriate that we close the month with an homage to a seasonal cheese that will soon once again begin its lifecycle in the spring. Wasik’s Cheese Shop handed us a chunk of the legendary Stilton cheese, as well a few niblets of information about this traditional English cheese that is best-enjoyed int the late fall/early winter. If you associate Stilton cheese with the holiday season, you’re cheese radar is on target. Traditionally, the best Stilton is made with cow’s milk collected in the spring and takes about nine months from start to finish, which puts this English veined cheese into your local cheese shop’s inventory right around November. A verified true Stilton, must come from one of the English counties of Derbyshire, Leicestershire, or Nottinghamshire. So, back to the production of Stilton, besides having a protected designation of origin, Stilton must also be made with pasteurized milk. So, for any of you pregnant cheese lovers, Stilton is worry-free! Go ahead and pile it onto your cheese plate! In just a few months, cheesemakers will start to stir that beautiful spring milk into vats, adding in blue mold spores, cultures, and a clotting agent. Eventually, the cheese thickens, gets a few dashes of salt, and is poured into round molds, which are turned until an earthy-looking crust forms. 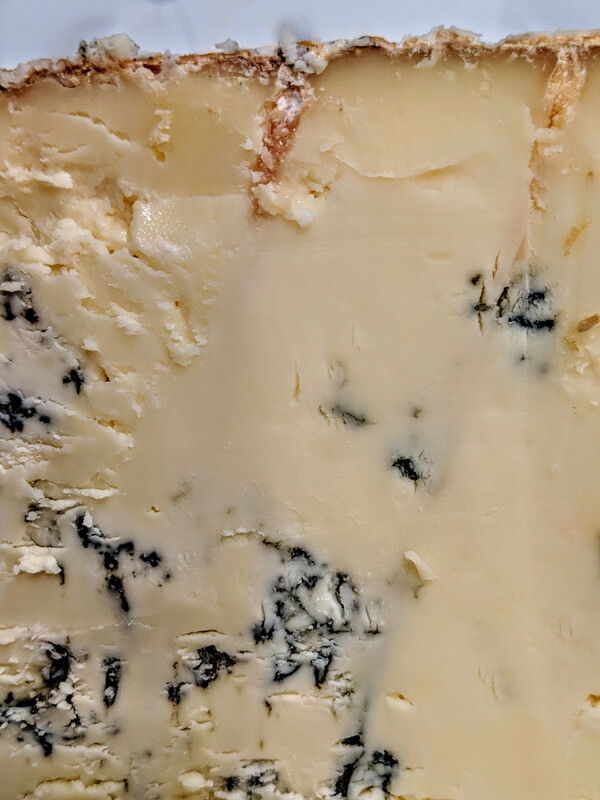 The cheesemakers then pierce the cheese, allowing air to filter throughout and create that delicate blue veining and mouth-watering salty, creamy, goodness that is Stilton. The cheese ages until about November when we are all ready for our in-season holiday favorite. These photos show the golden furry crust and where the holes are punctured. We can then see on the inside how those airy holes allow the spores to flourish. What to eat with your Stilton? The traditional pairing is, of course, port wine, but Brad tells us he’s a huge fan of plopping a slice on top of fruit cake, which sounds like the perfect way to make use of that other holiday tradition, that usually ends up getting lonely in the cupboard, unwanted and unloved. So, go get yourself a piece of in-season Stilton, before you have to wait until next fall! Don’t forget to visit Wasik’s in Wellesley. For a fun and unique gift, consider sending a cheese & goodies basket! I hanker for a hunk o’ cheese! And yet won’t spoil my dinner!